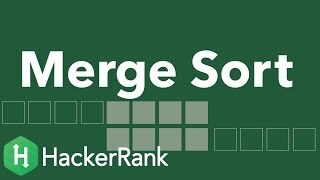 Check out the resources on the page's right side to learn more about merge sort. The video tutorial is by Gayle Laakmann McDowell, author of the best-selling interview book Cracking the Coding Interview. In an array, , the elements at indices and (where ) form an inversion if . In other words, inverted elements and are considered to be "out of order". To correct an inversion, we can swap adjacent elements. Given datasets, print the number of inversions that must be swapped to sort each dataset on a new line. Complete the function countInversions in the editor below. It must return an integer representing the number of inversions required to sort the array. arr: an array of integers to sort . The first line contains an integer, , the number of datasets. The first line contains an integer, , the number of elements in . The second line contains space-separated integers, . For each of the datasets, return the number of inversions that must be swapped to sort the dataset. is already sorted, so there are no inversions for us to correct. Thus, we print on a new line. We performed a total of swaps to correct inversions.